I'm sitting here in the NICU with our new grandson. My daughter is in her room sleeping, recuperating from a long hard delivery. who should still be in the safety, warmth and darkness of their mama's womb. Like a baby bird, they feed him mama's milk a tablespoon at a time via syringe. I sit here quiet, listening to his occasional little whimpers. and let the warm yellow light of my love pour all over him. He knows you're there and it won't be long before you can hug him any time your heart desires. What a precious privilege to sit with him in the early hours of his life! I know you will always treasure these moments, dear friend. Hi friend! Thank you so much. Hope all is well with you and yours! It is a good time to spend with the grand kid. When I click on the link on your blogger profile it takes me to a website filled with advertisements. Did you know that? I just went back to read of his arrival. Congratulations once again, and I love the yellow light quote. I am positive that is exactly what your hand is to him. Your tulips are beautiful and so is your grandbaby! I bet you can't wait to hold him, and won't let go when you can. My thoughts and prayers are with your family. Thank you, Michelle! He really has captured my heart and I definitely can't wait to hold him! I know your hands are eager to hold him....praying for him to gain strength each day. Thanks, Jill! He's already made great progress so we hope he won't be in NICU long. Remember the days when only nurses could touch the NICU babies? How wonderful for him to have his grandmother's loving hand on him during these early days. Also how wonderful it is to have a NICU unit near home. Your "warm yellow light" is beautiful. His mama can hold him, but transferring him from the isolette to her arms takes two nurses because of the breathing machine and all. He's doing great, so hopefully he won't have to be in NICU too many more days. Congrats on your new grandson! The tulips are beautiful and love your edit. Thanks so much, Barbara! I'm pretty smitten with our new little one. Awww...So sweet! And such a gorgeous photo, Elizabeth. Praying for all to go home soon, healthy and happy. Just as your hand is on your grandson, His hands are holding you up. I pray that you feel the sunshine of His love pouring over you. Blessings. Thank you for your prayers. He's doing really well and so we are hopeful that he won't have to stay in NICU too many more days. He's improving already so I hope he won't have to be in the NICU too many more days. He's going to be held so much by all of us, we're chomping at the bit! What a sweet little grandson...so precious, and I'm so glad they have you to lean on during this time. I always loved it when my Mom would come for the birth of our girls. She took all the pressure off, and truly blessed us all. I know you're doing the same! Love the tulips and the texture! Thanks, Becky! He's doing great, so hopefully he won't have to stay in NICU too many more days. XOXOXOX Sense your peace/hope/love/joy in this one. Thanks, Julie. Our little guy is doing great! Hopefully he'll get to go home in a few more days. oh isn't this the sweetest shot. beautiful light and wonderfully processed. Beautiful yellow flowers. Praying your grandson will be able to go home soon. And that you'll be able to hold him to your heart's content. Elizabeth, Thank you so much for making the time, especially with the happenings in your life, to share the news by way of this post. 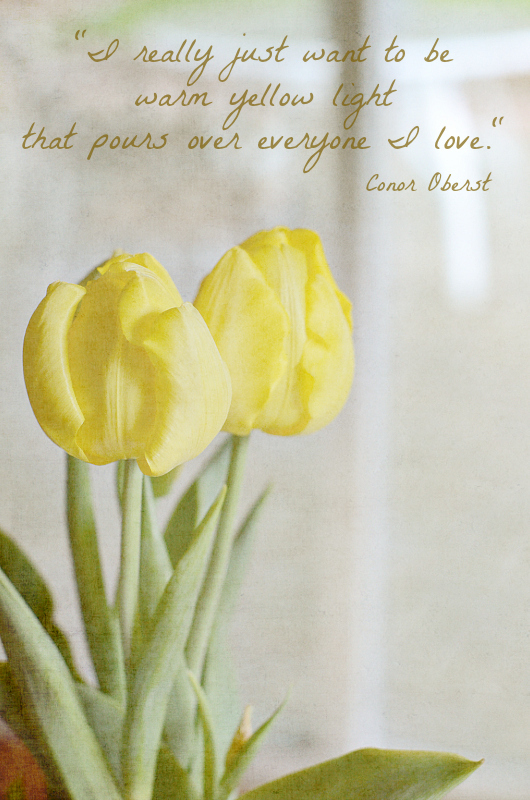 Your yellow tulip and quote are perfect both in composition and sentiment. Congratulations on your new grandchild. I have experience with the NICU from both sides, as a pediatric physical therapist, and as a mother. Please accept my prayers. I am hopeful that little soul will soon be swaddled in the arms of parents and grandparents and safe and sound at home. The baby is doing really well! He's off all breathing support and is starting to breastfeed, rather than tube feed. He should be out of the hospital by the end of the week! Precious words, the miracle of life and your soul beauty. Stunning. I just love you. That is all. Super sweet. And you have held him now... woohoo! Man I can read your Nana(ness) in this. Makes my heart smile. Hope your daughter bounces back pretty easily.